Field Studies – The BEST Way to Teach Critical Skills – Critical Skills! The Field Study is the most powerful method of enabling students to learn, practice and manage critical skills. 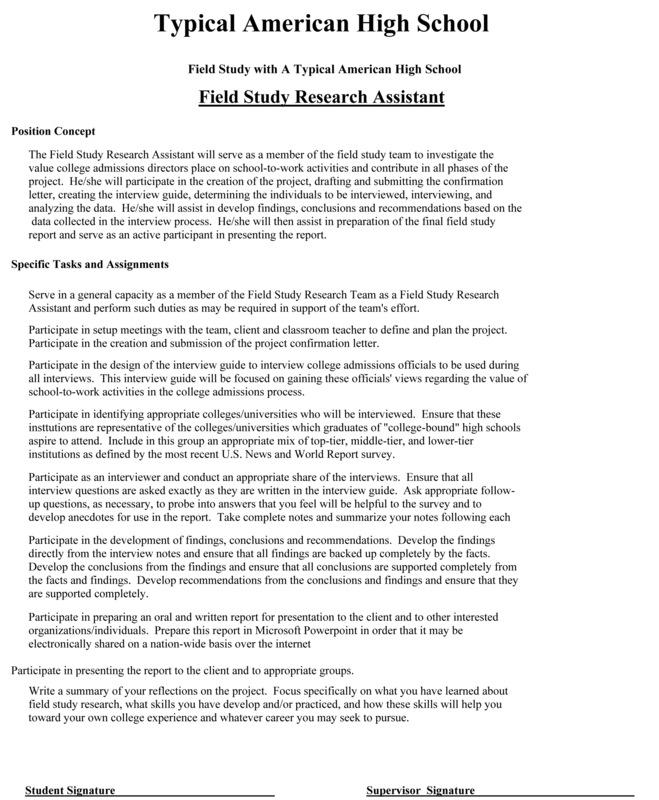 A detailed description of the field study process along with specific examples of field studies conducted and suggestions for field studies can be found at the following website: http://highschoolfieldstudies.com. The field study is a process that is generally followed by students at the graduate school level. In fact, this process is followed by Harvard Business School students as well as that followed by major management consulting firm. It is a systematic and disciplined way of solving problems. It works. The field study integrates all of the critical skills (with the exception of Continued Education): Communications, Production, Information, Analysis, Interpersonal, Technology and Time Management. Field studies can be done by students from ANY high school or community – large or small. All it takes is a willing faculty supervisor, perhaps a willing and enthusiastic parent who has experience professional work such as consulting, accounting, law, etc., and at least four enthusiastic students. The first step in the field study process is to assemble an appropriate team. Students need not be “gifted” to do field studies, but they should have a lot of common sense and a good work ethic because a field study can be painstaking work. 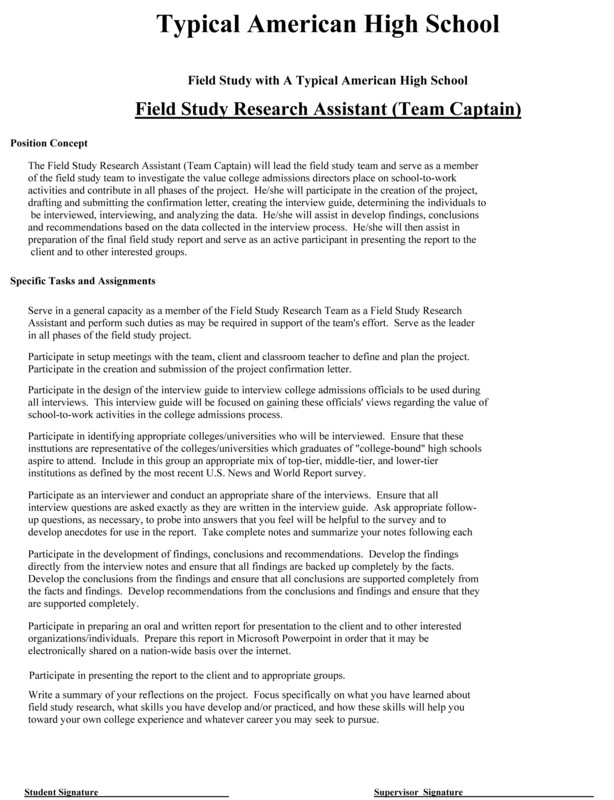 Experience suggests that a student with experience in field studies – most likely a senior – should serve as the team captain. I like to have the other team members to be juniors because this serves as good training for them and positions them to serve as a team captain of another field study team when they are seniors. The project selected should be substantive, interesting, but not too difficult. Typical field studies are surveys for businesses – asking customers their opinions, etc. Such a project is not too difficult and serves the purposes of the field study learning objectives. The supervisor(s) and team should meet with the client and budget approximately one hour for the meeting. They should prepare questions to ask the client about what sort of issues he/she is interested in finding out from his/her customer base. It is important that the client furnish the team with a list of customer names to be surveyed. The faculty supervisor should ensure that all individuals who will be surveyed are parents of students in the local school district – this is a necessary safety measure to ensure that the students will be interviewing “school friendly” individuals. The faculty supervisor should ensure that all of the issues are clearly stated and understood by the students before the meeting is over. A timetable for the project with deadlines for a progress meeting and final report. Any costs that might be incurred in the project. Each of the field study team members should sign the letter and the team captain and perhaps one of the team members should hand deliver the proposal letter to the client and review it with him/her. The client should have the proposal letter within 72 hours of the meeting. The first team meeting after the proposal has been delivered should be devoted to preparing the interview guide and creating the detailed work plan. The team should then develop the work plan which should be something as good as if not better than a Gantt chart. The work plan should allow time for the data to be collected, the analysis to be completed, and the report to be written. Specific deadlines should be set and a specific date should be set for a progress meeting with the client. This progress meeting should take place approximately half way through the field study. Perhaps a constraint of a field study conducted by high school student is that individuals who are interviewed should ALWAYS be parents of students within the school district. This is to ensure safety of the students as well as to promote the field study program to parents who might be interested in having their child participate in such a project later on. Interviews should ALWAYS be conducted by TWO STUDENTS – never just an individual student. This, again, is to ensure safety. When conducting the interviews, students should use the interview guide and ask the questions EXACTLY AS THEY ARE WRITTEN. Students should not “wing it” and ad lib the questions. Since all individuals interviewed in the field study are asked the exact same questions, developing the findings and conclusions from the interview notes will be a valid process (i.e., making sure “P” is true in the “P”  “Q” logical process). IMMEDIATELY following the interview – and without exception – the students should spend some time reviewing their notes and write a summary at the end of their notes describing exactly what they learned from the interview. This is essential to ensure that the notes are clear and can be clearly understood during the analysis process. The analysis phase of a field study can begin when approximately half of the interviews have been conducted. One danger that can befall students conducting a field study is that they will spend the majority of their project time collecting data and sacrifice the “thinking time.” The field study faculty supervisor and team captain should ensure that the team does not fall into this common trap. The analysis process is done during team meetings and the data discussed comes directly from the interview notes. The first step in the analysis process is to develop the FINDINGS, i.e., what do the answers they received from the questions actually tell them? These are NOT CONCLUSIONS and care should be taken when developing findings that the team does not “jump to conclusions.” Their goal is to find out what the data tells them relevant to each of the issues they have promised to address. An effective way to do conduct this process is with a flip chart. Write the question from the interview guide at the top of the flip chart, then go through each of the interview notes and write down the answers. It will become clear as the process proceeds that the answers are beginning to tell them something – a FINDING will begin to emerge. When there is consensus on the team that there is a finding, the team should construct a clear and meaningful sentence that describes exactly what that finding is. They should then write at least two and preferably three or four “dot points” under that sentence that supports what the sentence says. When doing this, the students are beginning to write a part of their final report – so this step is essential. Once all the findings have been determined, they should be listed together in a logical sequence. From this set of findings, the students should develop their CONCLUSIONS – i.e., what can we conclude from the findings? These conclusions should then be written as complete and clear sentences articulating clearly what that conclusion is; and, as with the development of the findings, under each conclusion should be at least two and perhaps three or four dot points that support that conclusion. Once the findings and conclusions have been developed, the team should hold a separate meeting and develop the appropriate recommendations from those findings and conclusions. Each recommendation should be written at the top of a sheet of paper in a complete and clear sentence with two and perhaps three or four dot points below to support the recommendation. This methodical and systematic way of developing findings, conclusions and recommendations is tried and true. Carefully done, it ensures that the logical process has been followed – that “P”  “Q” actually works. If care has been taken in the data collection process, then “P” is true and the conclusions and recommendations logically follows. This is Critical Thinking at work! The oral report can be the final written report put into a presentation format such as Microsoft Powerpoint. Each of the students should have a part in the final report and deliver it standing up in front of the client, the faculty supervisor, the other team members, and whoever else chooses to attend. The team captain should make the introduction and manage the presentation. One student should present the findings, one student should present the conclusions, and one student should present the recommendations. The team captain should field all questions. When giving the oral report, there are two mandatory requirements. 1. When giving the findings, conclusions and recommendations, the presenters should READ WHAT HAS BEEN WRITTEN AS THE FINDING SENTENCE EXACTLY AS IT IS WRITTEN – WORD FOR WORD. The team will have spent too much time and expended a lot of brain power creating that sentence, so the oral presentation is no place to “wing it” or ad lib. When reading the dot points supporting the finding/conclusion/recommendation, however, the student should be free to ad lib and even offer anecdotes taken directly from the interviews if desired. 2. NEVER should the student read a finding/conclusion/recommendation and follow that by saying, “In other words, . . . . . . .” If there are “other words” that can be used to make the point clear, then the “other words” should have been used in the first place! 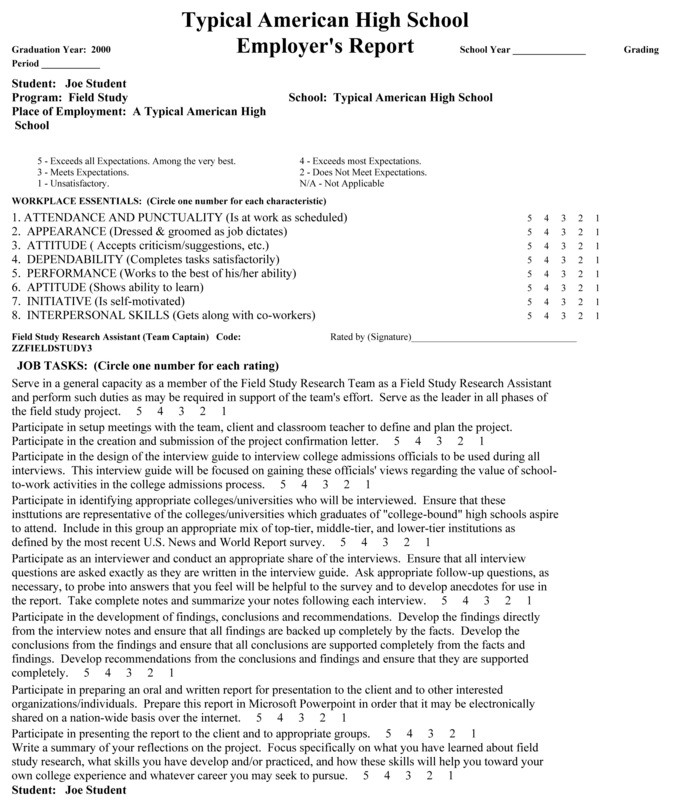 Examples of a field study position specification or work-based learning agreement are shown below. One example is for a student member of the field study team; the other is for the field study team captain. 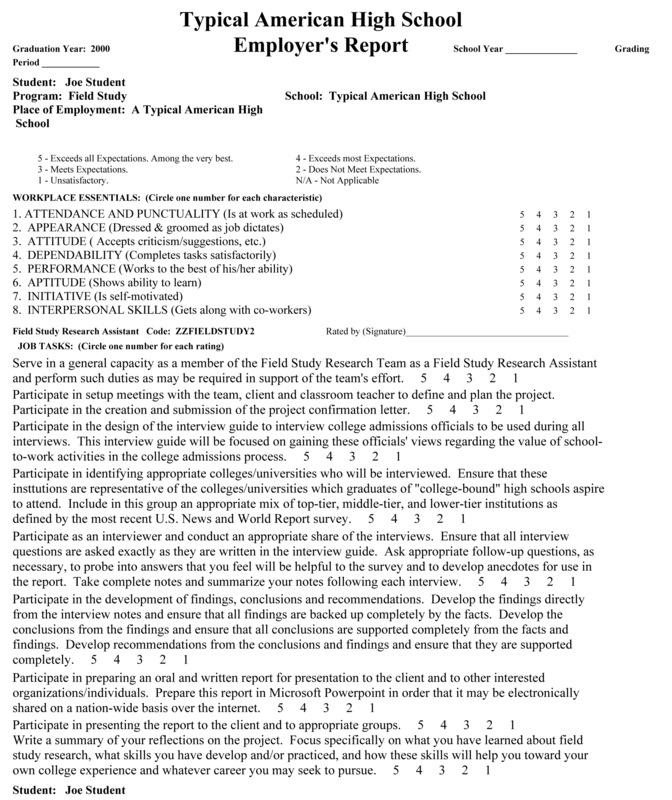 The authentic assessment documents for each are shown after each of the position specifications. If you want your child or your students to experience something very special, get them involved in a Field Study!